Sockeye salmon with the most arduous spawning journeys have the strongest hearts, an adaptation that may better their odds of surviving projected rises in water temperature. Sockeye salmon with the most arduous spawning journeys have the strongest hearts, an adaptation that may better their odds of surviving projected rises in water temperature, say B.C. researchers. Unlike human weekend warriors who risk heart attack with infrequent strenuous exercise, it turns out sockeye salmon are well adapted to their once-in-a-lifetime return to their natal rivers. 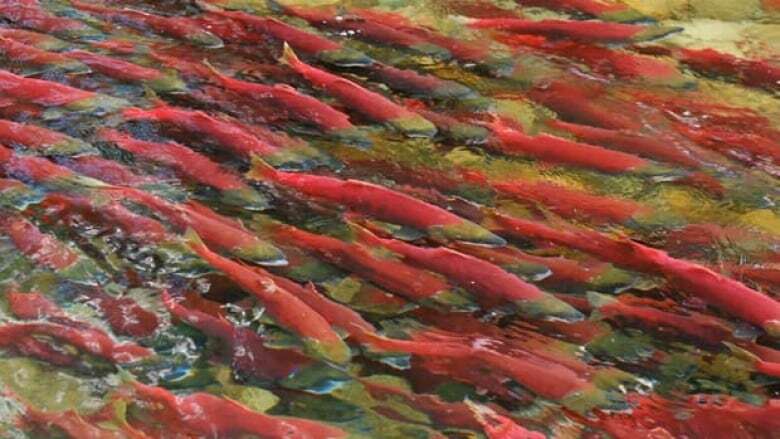 British Columbia's Fraser River is home to 100 distinct populations of sockeye salmon, with migration journeys of anywhere from 100 to 1,100 kilometres and an elevation gain of 10 to 1,200 metres. The new study shows the ones that go the farthest and highest have evolved extremely efficient hearts. "They have not only the largest hearts, but also special adaptations in their heart provide them with more oxygen," said fisheries biologist Erika Eliason, a PhD candidate at the University of British Columbia. Eliason is the lead author of a paper published Thursday in the peer-reviewed journal Science about salmon hearts and their implications for surviving climate change. She and her co-authors at UBC, Simon Fraser University and Fisheries and Oceans Canada suggest these "super fish" are more likely than others to survive the 2 C rise in water temperature projected for the Fraser River in the next 50 years. This is on top of the average 2 C increase in temperatures seen since the 1950s. Warmer temperatures make it harder for salmon to absorb oxygen and may allow infections to develop more quickly. In a study that involved peeling the hearts of 97 fish to examine the organ up close, the Chilko population emerged as the "super fish," said Eliason. "Chilko have more receptors in their hearts to bind adrenaline. And so at temperature extremes or when the fish exercises, adrenaline helps keep the heart beating fast and effectively," she said. "Because they have more receptors for adrenaline, we think they can more effectively use adrenaline, and that might be what protects the heart at higher temperature ranges." What this suggests is that the salmon's genome has the capacity to adapt to higher temperatures. But whether they can do so quickly enough is an open question, say the authors. It is also a question of increasing urgency. Fishers and biologists in B.C. are greatly concerned by recent declines in sockeye salmon populations and a federal inquiry into the issue is currently underway. In 2010 more than 34 million sockeye returned to the river in one of the largest runs in 100 years, surprising every one involved in the fishery. It was highly unusual given steady drops in spawning numbers since the early 1990s, and some experts say it is not likely to be repeated anytime soon. That's why scientists are paying close attention to Eliason's study. Salmon researcher Brian Riddell, president of the Vancouver-based Pacific Salmon Foundation, calls it a "very good study." He says it supports the wild salmon strategy of Fisheries and Oceans Canada that calls for protecting spawning habitat to ensure biological diversity. "You maximize the number of fish that spawn so natural selection can operate and produce populations with strong hearts," says Riddell. While it's not possible to control increasing global temperatures, fisheries managers can restrict development to protect pockets of cooler water where salmon tend to linger. They can also restrict fishing to ensure enough salmon reach their spawning grounds. "If a population is showing rapid decline at higher temperatures, you're going to need to provide more fish in the spawning grounds to maximize the chance you'll get genetic combinations that will survive through those increasing temperatures," says Riddell. University of Washington aquatic ecologist Daniel Schindler also praised the paper as a "clean piece of research," but suggested other factors, such as migration timing, may be just as important as physiological adaptation to higher temperatures. "In fact, work from our group suggests that substantial changes in migration timing are likely in the near future that would enable populations to avoid extreme river temperatures during their upriver migrations," he said.